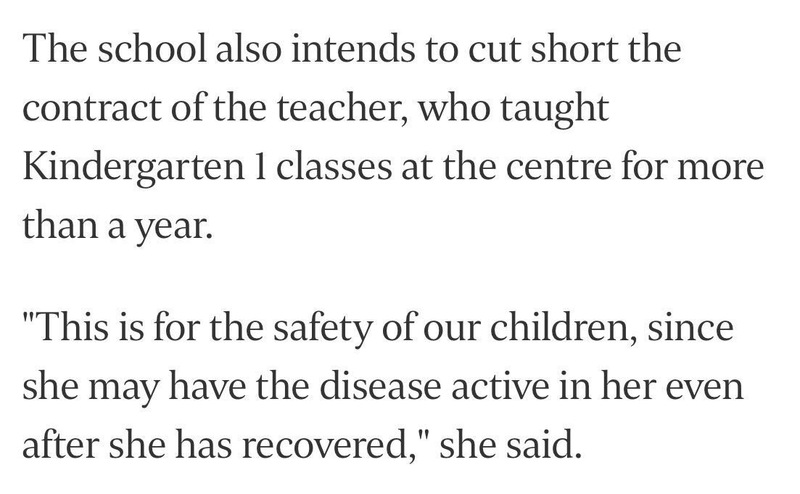 A colleague pointed out that the preschool teacher diagnosed with pulmonary tuberculosis could have her contract terminated early, according to news reports, although this part was not clear from the Todayonline report. I hope that this does not happen. TB-infected patients are generally not infectious after just 2 weeks of appropriate therapy, and the vast majority are cured after completing 6 to 9 months of anti-TB therapy. Transmission of TB virtually always happens prior to starting therapy, when the patient with pulmonary infection is still coughing away. Firing a person, or early termination of the work contract because of an infectious disease such as TB, further perpetuates the stigma of the disease, and has the counterproductive effect of deterring people from seeking early medical attention (for prolonged cough, for example), going for TB diagnostic testing, or even persisting with completing the long treatment regimen. Is the employee with TB protected by law from being fired for the sole reason of his/her infection? In the United States, TB is considered a “disability” during the time of treatment, and the Americans with Disability Act covers employees with TB from any form of discrimination including demotion, sacking, or generation of a hostile work environment. I could not find a similar law or regulation in Singapore. Although we have ratified the UN Convention on the Rights of Persons with Disabilities, it is not clear that TB is viewed as a “disability” here. The Employment Act has a section that covers sick leave, but this is general and hardly covers for the duration of TB therapy, including directly observed therapy (DOTS). We have a tripartite guideline on fair employment practices, but the “discrimination” described does not extend to illnesses. Therefore employees with TB appear to largely depend on the good graces of their employers with regards to keeping their jobs, and may have no legal recourse if dismissed after the sick leave period. Hopefully someone with a better understanding of the law (or a news report in the next few days) will clarify this and prove this wrong.